in this topic we will Discuss the Causes & Solutions of Two Main types of Noise Which is occured in WD HDDs (Especially Related To L-shape PCBs). if Q3 is Damaged it will burn ur R120 after u replace it , so be sure that Q3 is ok before replacing R120 & u may also Check Transistor Q6 by the previous method to be completely sure it's safe to replace R120. 3- Check The Coils (such as L2 & L7) - adjust ur multimeter to diode mode then the right value must be ( 0.000 ) for any coil as u all know. 4- inspect the whole PCB for any removed component ( such as small capacitors or Resistors ) ... the removal of these small components may occured while forced cleaning of the PCB .... so becareful while cleaning it. the link below contains a high resolution image which shows all the electronic components I have mentioned above - i'm very sorry i couldn't upload it to this forum cause it's over than 512 KB. 1- clean the connection points which connect the head stack pins with the PCB using a pencil Rubber ...carefully. 3- if the two steps mentioned above didn't fix the problem , you have to replace the motor IC cause it's damaged. -Note- in case of Motor ICs (L6278 1.7) & (L6278 1.2) first try to desolder them then resolder them again before u decide to replace them with a new ones ... this sometimes work , but if it didn't work ... replace them directly. - in case of Motor IC (Smooth 1.3) you must replace it directly. Caution : it's Strongly Recommended To replace The Motor IC Directly when you are sure that it's damaged (I mean when it's damaged without any external symptoms like burns) ... even if it's (L6278 1.7) or (L6278 1.2) without any attempts with the Damaged IC (cause i think that trying to fix the problem by desoldering the damaged IC and resoldering it again (in case of Motor ICs (L6278 1.7) or (L6278 1.2) as i mentioned above) may damage the PCB when you power it on again with the damaged IC. Shortly : when the Motor IC is damaged ... just replace it Directly. Addition to the topic there is another way to check the motor IC u can check its temprature after powering the drive if it gets hot then change motor IC . yes Rameez that's right .... feeling IC heat is one of the most common methods to detect the Motor Ic Damage especially when the hard drive didn't respond after we power it on .... but when the motor IC is responsible for the Continuous Noise i think it's never got Hot and its' temperature will be normal although it's already damaged ... so we have to replace it. Caution Don't Forget to ground yourself when you are working with HDD PCBs to avoid the risk of ESD (Electrostatic Discharge) Cause it may damage the PCB or even may affect the long term reliability and performance of its' components .... so ground yourself first before touching the PCB's Components. i'm very sorry that the download link of the high resolution image got invalid .... so here is a valid one ... i'm sorry i couldn't attach it directly to this forum cause it's over 512 KB. 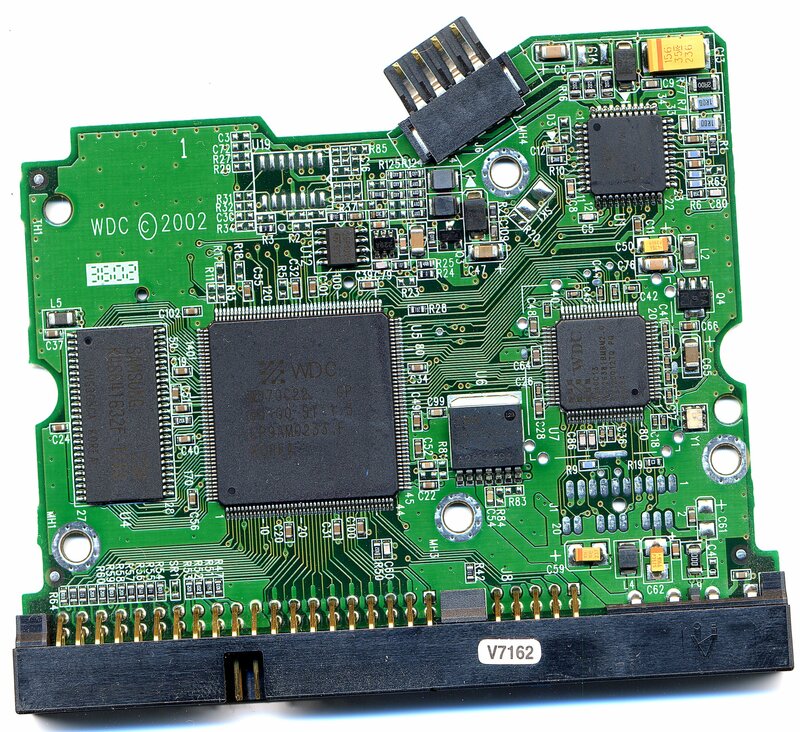 You seem to be very knowledgeable in PCB ; i have myself a problem with my drive's PCB (hard-disk-drives-repair-and-data-recovery-f1/pcb-needed-for-diamondmax-21-250-go-t8176.html) and i wondered if i can send it to you for repair? Any other suggestions are much appreciated. i read ur topic which is entitled with "PCB needed for Diamondmax 21 250 Go"
it seems that your donor PCB has a different model of Motor IC ( the small square one u have mentioned in ur topic) - but i'm not sure if it represents a problem in this model of maxtor or not. u know Gene here in egypt the most common Hard disk is western digital (WD) so i got much experience in WD HDDs but my experience with maxtor is limited.... Cause it's not common here in egypt. i hope that one of HDD gurus have good experience with maxtor HDDs could help u solving ur problem. Thanks for your fantastic article. However, I do not have an L-Shaped board and I'm having trouble finding some of the components you referred to. I have put a picture of my board at the following link; I'd be grateful if you could highlight the components on it and email it back to me. I will repost it there so that other people can refer to it too. Also, do I have to desolder the components to test them, or can they be tested directly on the board? first let me thank you for your kind words about my article. belongs to WD L-shape PCBs. just tell me what is the problem with this board , so i can help you .... is it a clicking noise issue ?? about testing the components , you can test them directly on the board with the multimeter without Desoldering them. Thanks for the fast response! Yes it is a clicking noise. When I power on the drive, it spins up and goes "Click, click"... pause... "Click Click". It does this about 10 times then spins down. The clicks in your drive can be 4 tings: faulty Pcb, Firmware, preamp/heads or scratched platters. 1.Buy a new/used drive or Pcb of the same harddrive model you got (WD1200JB). 2.Desolder the ROM chip (U12, red ring in the picture) on your old board. 3.Replace the chip on the new board. 4.Start up the drive and access your files. If your drive still knocks or clicks after that, the problem is further down the line and not so easy to do without special tools. Hello Ahmed_Samy, thanks for the great article. Recently a power surge killed my hard drive. Drive doesn't spin up or detect in BIOS. A closer inspection revealed that the R120 and a STPA (what's that component?) has burned. Other components still looks Ok with root eyes. So, if R120 is burned, the drive won't spin up? What about STPA? I'm going to get a dead WD 40GB from a friend to get two of these component. R120 acts like a fuse in marvell pcbs if any of the components burns it burns it self to prevent further damage . Replace STPA and check STPB as well and sometimes D3 the diode also gets damage check that too . If everything else is good replace the damaged components only .